Starself / We are entering a major Aries time period! A very exciting and somewhat dangerous period is upon us. Planets are bunching up in Aries and in Pisces; quite the opposite of each other. The scope of this newsletter however will be about 3 special times between now and spring, showing you what the Aries stelliums will be doing. One reason I have been so absent lately with newsletters is that I have grown overwhelmed with the continuing story of Pluto. It seems that I have been writing about little else since 2005. Well, that’s really what it’s been about. I don’t think I have to tell you more. Nevertheless, now, the story is about REVOLUTION, which is upon us, not coming. Don’t let that scare you; often times revolutions are what are necessary for healing and that seems to be the case right now. Granted, there are good ones and bad ones; I’m not talking about a national coup-d’état, mind you, but rather an awakening of the people for good purposes. The first for February 20, 2017 and the second from 8 days later, February 28, 2017. First, note the new symbol for Eris (the goddess of discord in Greek mythology), which looks like the symbol for Mars pointing downward. She was discovered in early 2005. Her orbit is way beyond that of Pluto. She is categorized as a massive “dwarf planet”, certainly an oxymoron. Much more will be discussed about her as it surely appears that she is here to be included in astrological vernacular, which is no small feat in astrology. She is quite likely responsible, along with the coming conjunction with Uranus for the rebirth of the “Divine Feminine.” A subject way beyond the scope of this document. This has been and will continue to be a very important subject on my online Astrology show, “Astrology Unplugged”. After the live broadcast, each is archived and available on my YouTube channel. THE REAL DANGER WILL BE FEBRUARY 20-21, 2017. 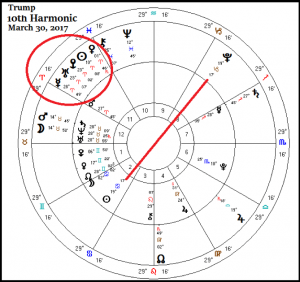 With transiting Mars squaring Pluto, we must watch out for an itchy trigger finger upon the part of the “new administration”. This is extremely volatile. Nevertheless, she is in the sign of Aries and moves through the zodiac very slowly, taking about 557 years to orbit our Sun. Note how close she is to transiting Uranus right now, scheduled for exact conjunctions: 6/8/16, 9/26/16 and 3/16/17. Sound like our election? Much more about her later. Focus on diagram 1 and how there are 4 planets in Aries and diagram 2: Five. Certainly, Mars is the “war-like” planet, but don’t get all excited yet. It means much more than that. I will be going on over its general effects per Sun sign later in the article, but let’s talk about what this means in general. I’ll never forget the time period around May 27, 2010. Why? Because that was the day that Uranus ended its 84-year stay in one zodiac and switched into an entirely new one in Aries. That was one big deal. Up until that time, my non-Aries clients commonly were not very sure of themselves. (Aries are). They relied upon discussion, sounding-boards, and affirmations – sometimes, permission before they could “release their own desires.” All of a sudden, after that date, I started to see many people simply launching themselves as they desired without looking back. This was very significant and I felt it in my own engine room. Similar to that time, with all of these current groupings of planets in Aries, that’s what you’re going to see again. There are many ups and downs about these combinations. Do not blame the planets if your life gets out of whack. This article is here to forewarn and educate you, not to provide blame outside of yourself. There are many things to look for during these times, especially during the times mapped out above. You will feel like becoming aggressive; asserting yourself. This can be very good and indicate exactly what you need. But, as I’ve always said, separate aggression from assertiveness. Two very different things. Be very FOREWARNED AGAINST RAGE. Do NOT go there. You will most likely be very sorry if you do. It is definitely a time to assert your plans. Look at yourself and not others as to why you have been “held back”. Simplify your life, nuf said. Do not be surprised if the USA or other countries inch real close to war. This does NOT mean that there will be, but the odds go way up during Martian times. Guard against being too impulsive. The more you have held back in the past or repressed yourself, the more likelihood that your assertions will come out in a distorted fashion. 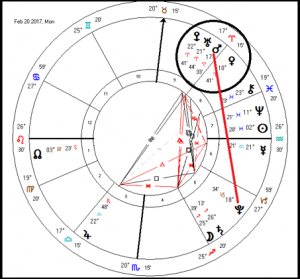 With Uranus involved in the midst of the other personal planets, you will have a very uncommon, sudden desire to make drastic changes. Be alert. Think things through especially if you are convinced that others are “keeping you down.” Usually, not the case. This is a wonderful time to STAND UP! You are seeing this everywhere. This is indeed the American Spring. Notice how Uranus was very early into Aries around the same time that this liberation-seeking impulse hit the countries of Northern Africa and the “Arab Spring” came about. Same thing. WE MUST REALLY REIGN IN THE DESIRE for any type of violence. It will only hurt. And that also means in our TONE OF VOICE and how we treat each other. What we are going through now is a dramatic identity crisis in this country that is just getting started. NO ONE took America from us regardless of what DT says. Here we are. Cooler heads must prevail as we rebuild anew, productively. Blame only hurts the blamer. Next: A very dangerous, significant time period. The inner wheel is that of Trump’s 10th harmonic. A harmonic chart is derived from the birth chart, with 10 being related to the 10th sign of the zodiac, Capricorn. Harmonic charts are little-known and are extremely accurate. The 10th one stands for one’s PUBLIC STANDING. Your place in the Sun. These are THE charts I look at when “falling from grace” seems to be in store. The outer-wheel shows where the planets will be on MARCH 30, 2017. Note not only the five planets in Aries and the near-perfect conjunction of Eris and Uranus BUT PLUTO IS EXACTLY OPPOSITE HIS SUN. This is extremely significant and shows great opposition from “the powers that be”, foreign entities and life itself. I am NOT predicting his downfall at this time but I can tell you two things, 1) He will face tremendous opposition from seemingly karmic/collective forces and 2) I wouldn’t want to be him. This may not manifest exactly on that day, but it will be close. Keywords for that day are: Nuclear, power struggles, abuse of power. Taurus: You should be feeling like “getting things off of your chest”. Old matters will emerge; things you thought were resolved may pop up again. Gemini: You will want to be very active with friends and groups. This is a great time for you to go after your big dreams. I mean really. The big ones. Leo: An itch to travel may come across you. You need to expand your circles now. Go, travel, do! Virgo: This is a time to get in touch with your sexuality, a subject usually tamed by Virgoans. Assert yourself if your relationships that are not bringing satisfaction to your needs. Libra: You need to be more objective about your partners. Now is not the time to see them as your other half. It’s time to see them for who they are. Scorpio: Now is the time for you to dig deep and learn new skills that will further your evolution. Apprentice yourself to another. All that you learn now will come back to really help you soon. Take preventive actions towards your health now. Sagittarius: Time to play. I don’t think I need to talk you into that. Take a vacation. Capricorn: Awkward, time to assert your own needs within your family. Forget about what you should do; express your feelings now. Or, you’ll get more stuck behind them. Aquarius: Shouldn’t be hard for you to do: Speak your mind! Pisces: Fight for your own self-worth. Finishing second or last is not desirable anymore. Really, it’s okay for you to win now and then! I am forming an 8-week online beginner’s course, contact rick@starself.com if you are interested. 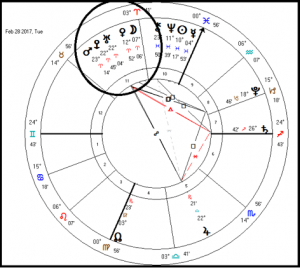 Yes, I still read personal charts!